Where there’s a will, there’s a way is a popular expression perhaps coined by fishermen. If there are fish swimming in a lake, fishermen will figure a way to get their hook in front of them. This was proven to me on a recent trip to Nebraska where I had the chance to fish Lake McConaughy near Ogallala. It’s a huge lake (largest in Nebraska) and surprisingly, it was built by private enterprise instead of the government. The purpose for the lake is two-fold, to produce hydro-electric power and provide water for irrigation. Recreation such as fishing, boating or water sports was down the list and the management of the lake still puts hydro-power and irrigation before recreational needs. To recreational users, that means the water level in the 35,000 acre lake fluctuates annually and sometimes drastically. 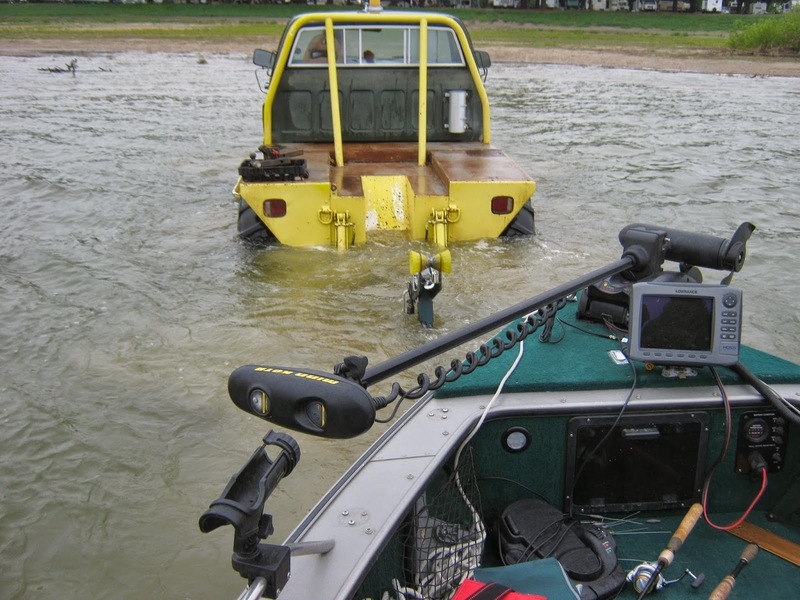 Boat ramps built for normal water levels sometimes terminate high and dry when water levels fall below target levels. In other areas, boat ramps are non-existent. The fishing trip I made on Lake Mac, as it’s know locally, originated at Van’s Lakeview Fishing Camp. (www.vanslakeview.com) There, they’ve come up with a unique answer to how to deal with the fluctuating water levels in the summer. 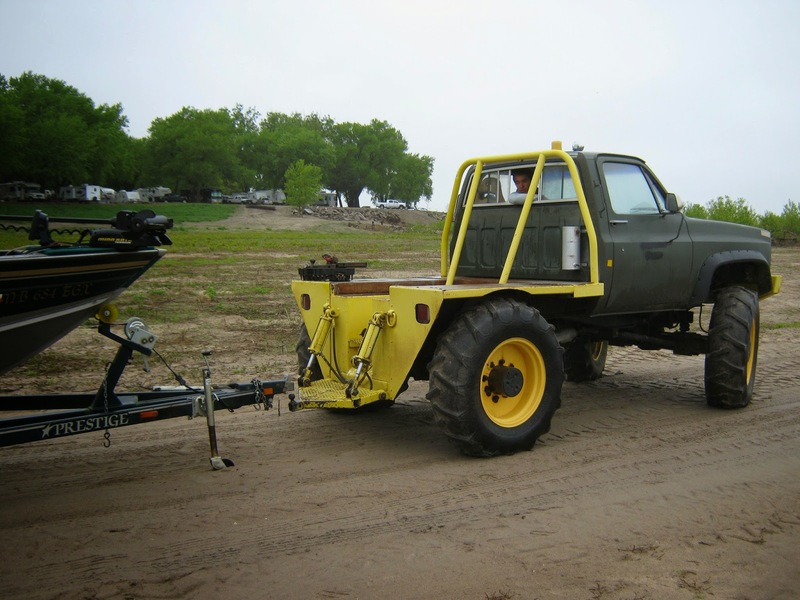 They do have a concrete ramp to launch boats in the traditional way, but when the water drops low enough to make the ramp unusable, they have a trio of specially modified trucks to put your boat where it needs to be. They have a gently sloping, sandy bottom bay adjacent to the camp. Just unhook your trailer and go park. They will hook up and back your boat into the water 20 or 30 yards - whatever it takes to make it float. At the end of the trip, the process is reversed. In between, fish for walleyes, pike, hybrid stripers, smallmouth and all the other species for which the lake is famous. I’m a destination traveler and I’m good at it. If I need to be at a place four states away where the ducks are flying, a fishing hotspot in Minnesota or where ever I’m heading for whatever reason; expect me to start early, travel swiftly and arrive on or ahead of schedule. That’s an admirable attribute, I suppose, but there’s another type of traveler. There’s the person who has a destination in mind, but meanders in that direction apparently with no particular schedule. These are the people who stop at a sit-down restaurant instead of breezing to the drive-through window at lunch time. These are the people who stop to read historical markers erected to commemorate obscure events or places less important than where I caught my first fish. These are the people who know where the world’s largest ball of twine is located (Cawker City, Kansas) or where you can find a statue of the Jolly Green Giant (Blue Earth, Minnesota). I’ve seen the sign for the Spam Museum dozens of times and still have not walked through the doors. This week I’ve been traveling the western half of Nebraska, supposedly in search of sport fish and panfish swimming the fertile waters of Nebraska-land’s lakes and reservoirs. They are there, I’m sure. I’m also sure the weather in this area is not always winter-like and usually more on the verge of becoming drought ridden, than over-saturated. My fishing partner and I were to be on a tight schedule. Get up early, catch some fish in Swanson Reservoir in the morning and then drive 240 miles to end up at Merritt Reservoir for a late afternoon excursion to investigate the fishing there. Then off to the next places, the next day. The wind, the rain and even a brief May snowstorm changed our breakneck schedule from one only a traveler like I could understand, to one where we might as well sit down for lunch, because our afternoon outing was scrubbed long before midday. I looked at a historical site overlooking a cow pasture proclaiming a pioneer era church once existed where the cattle now grazed. Then we found a modern replica of one of the world’s wonders. Have you heard of Stonehenge? Just outside Alliance, Nebraska is a nearly exact replica, precise in size and scope with one slight twist. It’s made from junk automobiles. 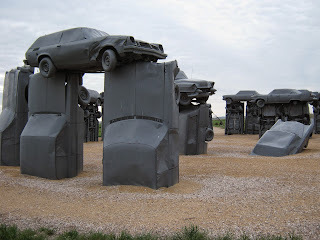 It’s called Carhenge! I stopped, stood among the monoliths, amazed. One question immediately immediately popped to mind. One of the missed opportunities of my life occurred by the time I was 21 years old. By then I was an outdoor lover and a young man who craved to hunt and fish for exotic (to me) animals and fish in far off places. The greater prairie chicken certainly filled that bill. Once an abundant game bird on America’s Great Plains and prairies, their numbers actually increased when the white settlers first homesteaded across the land. That turned out to be only a minor bump the bird’s history. As more and more of the native grasslands were converted to agriculture, their habitat dwindled as did their numbers. While they were abundant, they became an important wild game meal for protein starved settlers. In many areas they faded into history; in others, they now are listed as game birds with stable populations that allow a regulated harvest. Little did I know at one time this history was played out right here in Newton County. Much of the county was a part of the historic tall grass prairie and as happened elsewhere their numbers increased temporarily, then dwindled to extinction. But the extirpation didn’t happen here until 1973. In 1974 DNR biologists failed to hear or spot any prairie chickens on their leks in McClellan township, just south of Lake Village. Leks are also known as booming grounds. 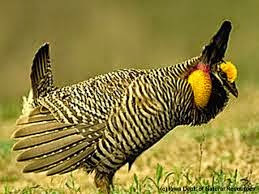 It’s an area where male chickens go each spring to display, strut and vocalize to impress female prairie chickens. The same leks are used year after year dating back as far as anyone can remember. Though the DNR purchased 640 acres as a Prairie Chicken Refuge, the final lek in Indiana was actually on what was then the Karlock Ranch, now a part of The Nature Conservancy’s Kankakee Sands property. In 1951, when I was just two years old, there were 17 active leks across the northern part of the county. 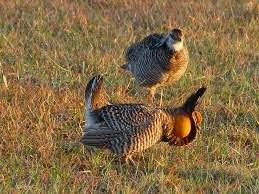 Historical accounts of early life in Newton County, when market hunting was a common occupation, accounts of game harvested and sold always included prairie chickens. Had I known of this as a young man in high school, I’d have been there, sneaking to one of the last remaining active leks, hiding hoping to at least spot one of Indiana’s disappearing bird treasures. There was once discussions of reintroducing them on the TNC lands, but I haven’t heard of movement on that plan in years. That’s why I was so intrigued on a recent trip to Nebraska. While eating lunch with Carol Schlegel, tourism director for Red Willow County, headquartered in McCook, my interest peaked when she mentioned their Prairie Chicken tours, held each spring. In late winter, they park a specially designed trailer "blind," a converted stock trailer, on a prairie chicken lek a short drive from town. In March and April, when prairie chickens come to do their spring ritual, the trailer is in place and is simply a part of the landscape. Just before dawn, the participants sneak to the trailer, hunker down and wait for the birds to come display. According to Schlegel, most mornings at least a dozen males and an indeterminate number of females come to show off and often display within a few yards of the trailer. The program started in 2014 and the number of participants doubled last spring with travelers from across the country and several countries from around the globe attending. Reservations are required. It’s actually an easy, two day experience. The night before your turn in the trailer, you attend a program learning about prairie chickens and what to expect in the morning. Then an abbreviated overnight stay (I recommend the Horse Creek Inn), then off to the lek in the morning. Check out www. prairiechickendancetours.com.